WASNT MEANT TO BE, 2017, Aquaresin and geodes on ACM panel, 28" x 24"
“Painting is a practice in the pursuit of a particular kind of knowledge, and in this sense it is quite literally a technology. I use painting to better understand the nature of connectedness, meaning, communication, and language. For me language and painting are affiliated for two reasons: First is the historical idea of abstraction as a “universal language”, and second is that plasticity is in the nature of both. I believe, as many early twentieth century adopters of abstraction did, that there is more to reality than what we can perceive directly. Painting is a way of manifesting other layers of reality so that they can be perceived. I don’t consider this to be about a singular truth–how things ‘really are’. For me the question is how do we come to know things? I’m chasing the feeling of understanding. To comprehend, to fathom, to consider: that is the goal. The need to know as a desire in its own right is the driving force. I’m working on the project started by af Klint, Mondrian, Kandinsky, Kupka–but with the distance of a century gone by. The promise and failure of abstraction to function as a universal language is a disappointment that is not easy to get past. Languages by their nature are specific and always changing. They aren’t universal. As objects, my paintings project into the social space of a room as signs. The meaning of the text–often referencing a familiar idiom–morphs as the words become enmeshed in the surface. I use texture and finish to create difference within a painting. As a viewer moves around the work, depth is revealed through transparency, reflection, and incision. Some paintings use natural materials–like geodes and fossils–items I’ve collected while on hikes at a nearby lake. There is an element of ritual. 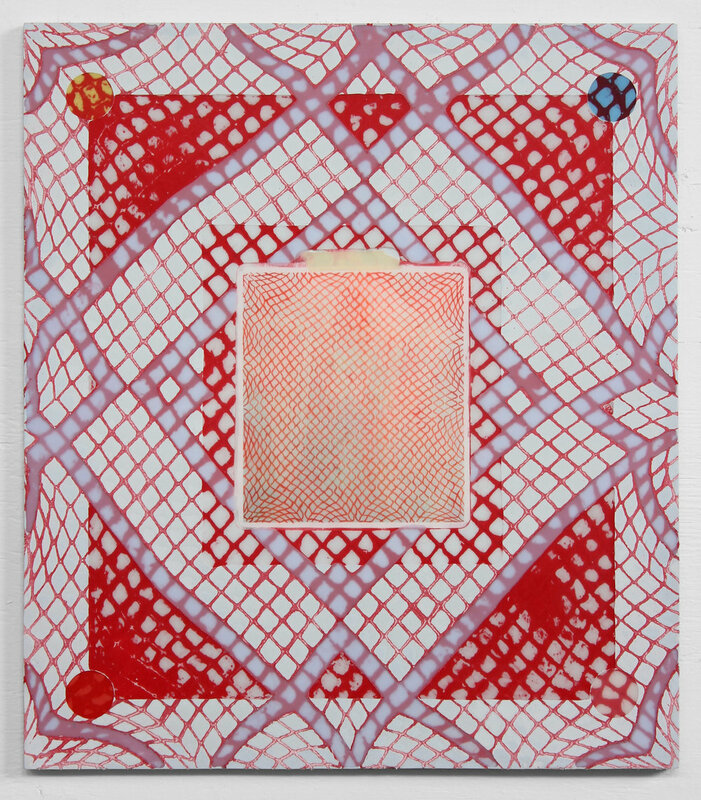 Other paintings use resin, hand cast tiles, and nets to create warped grids. The grid becomes the scaffolding the painting is built on. I use the grid because it is the underlying structure of the two-dimensional realm. Making grids by hand, using nets, and imperfectly cast tiles–this is how I reckon with my reality in three dimensions. The grids are the structure that contain the information. Usually this information takes the form of text, but sometimes other kinds of information–a drawing or diagram–get inlaid under a layer of glass-like resin. The directness of the mark is displaced, just a millimeter or so under the painting’s surface. TOO GOOD TO BE TRUE, 2017, Aquaresin and geodes on ACM panel, 48" x 40"
Geode Zodiac, 2018, Aquaresin and geodes on ACM panel, 24" x 21"
ONLY TIME WILL TELL, 2018, Resin on ACM panel, 48" x 42"
MAKING SENSE OUT OF NONSENSE, 2018, Resin and crinoid fossils on ACM panel, 48" x 40"
DONE IS DONE, 2018, Aquaresin and geodes on ACM panel, 21" x 24"
ABSENCE PRESENCE DESIRE HORROR, 2018, Resin,net, latex enamel on ACM panel,48" x 40"
Crystal Grid (Phones), 2018, Aquaresin, resin and geodes on ACM panel, 48" x 40"
GOES AROUND COMES AROUND, 2018, Aquaresin, net, latex enamel on ACM panel, 48" x 56"
HERE TODAY, 2018, Geodes and Aquaresin on ACM panel, 24" x 30"
Red Grid (Insert), 2018, Resin, net, and drawing on ACM panel, 24" x 21"
AM I ANYONE 1986-2018, 2018, Aquaresin, net, latex enamel on ACM panel, 48" x 56"
IT IS WHAT IT IS, 2018, Resin, net and drawing on ACM panel, 24" x 21"